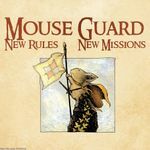 New Rules, New Missions is a 44-page booklet that presents a smattering of additional rules—including new "weapons" for various Conflicts, and rules for saddling up a rabbit mount—alongside a host of welcome setting material: a new patrol culled from the pages of the second Mouse Guard comic series, three new Settlements—Flintrust, Grasslake, and Sandmason—, the addition of Celanawe to Kenzie's patrol as a playable character, and three brand new exciting Missions! This item is just the PDF of the softcover expansion rules booklet bundled with the Mouse Guard Roleplaying Game Box Set. You do not need to own the boxed set in order to make use of the new material in this PDF.